for Phorus and Play-Fi products! Spotify just got a whole lot better! How? 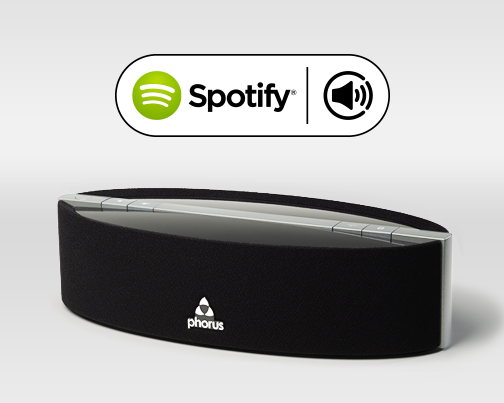 Because now you can group your Phorus and Play-Fi products together and play to them all at once from the Spotify app. Spotify Connect and Play-Fi have come together to form the ultimate whole home package with pretty much all the music on the planet played through the best wireless audio systems from amazing brands and manufacturers (including Phorus, naturally). So actually how does it work? From the Home screen of the Phorus app (left), select the Spotify service. This will bring you to a familar screen telling you how to use Spotify Connect (middle) that even has a helpful button to launch the app. We've added a new button at the bottom of that screen that, once tapped, will allow you to create groups specifically for Spotify. After you've elected to create a new group and given it a name (we called ours "Phorus Party" in the example) you can then pick from any of your Phorus or Play-Fi products to be added to this group (right). This won't affect any of your custom gorups in the Play-Fi app, and won't permananetly merge them together. This way you can still make use of the modular Play-Fi system and easily swap between speakers that are playing in groups and those that are not when using the speakers for something other than Spotify. Any speakers that can't be joined in a Spotify Group will be greyed out, such as with the Wren V5PF. Their new model, V5US, is compatible though. With Phorus the PS5 and the PR5 are the only products currently compatible with this grouping. Once you've got your group set up, head to the Spotify app, and on the Now Playing screen (left), tap the Spotify Connect notification on the bottom, which we've highlighted in this example. This will open the Spotify Connect screen (middle), and you'll be able to pick from any Spotify Groups you've created, your wireless stereo pairs, or individual speakers that are not part of any groups or pairs. We picked the group we just created, Phorus Party, and this will take us back to the Now Playing screen where we can see what we're playing to highlighted in Spotify green. If we close the app, or if we begin to use another Spotify app on another device, whether at home still or out and about, we'll still be able to pair to and play to this group we've created as long as we played to it once at home. So you can keep the party going, even if you have to make a quick run to the store. Anyway that's all for now. If you're enjoying Spotify Multiroom already, or if you have any suggestions or requests, let us know in the comments!